Scroll down for comparisons between Standard, Medium, and Ultra. MATERIAL: Expanded perforated metal with melamine foam backing. APPLICATIONS: Offices, conference rooms, board rooms, airports, lobbies, convention centers, retail stores. COLOR: White metal, chromed metal with colored backing inserts (light gray, charcoal gray and white). FLAMMABILITY: Class 1 fire-rated for smoke density and flame spread. INSTALLATION: Layin - 15/16” teebar grid system. Slight tegular edge. 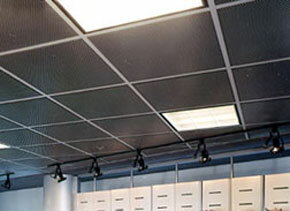 Highly modern decorative Acoustic Ceiling Tiles with high-tech expanded perforated metal grid and melamine foam backing. Available in Standard, Medium and Ultra patterns. Perfect for offices, conference rooms, board rooms, airports, lobbies, convention centers and retail stores. White metal and chromed metal available with colored backing inserts of light gray, charcoal gray, or white. Panel Sizes: 24" x 24"
Panel Sizes: 24" x 24" or 24" x 48"
Panel Sizes: 24" x 24" , 24" x 48" or 48" x 48"